Steve Freeman is an independent consultant specializing in Agile software development. A founder member of the London Extreme Tuesday Club, he was chair of the first XPDay and is a frequent organizer and presenter at international conferences. Steve has worked in a variety of organizations, from writing shrink-wrap software for IBM, to prototyping for major research laboratories. Steve has a Ph.D. from Cambridge University, and degrees in statistics and music. Steve is based in London, UK. Nat Pryce has worked as a programmer, architect, trainer, and consultant in a variety of industries, including sports reportage, marketing communications, retail, telecoms, and finance. With a Ph.D. from Imperial College London, he has also worked on research projects and does occasional university teaching. An early adopter of Extreme Programming, he has written or contributed to several open source libraries that support Test Driven Development. He was one of the founding organizers of the London XPDay and regularly presents at international conferences. Nat is based in London, UK. Freeman and Pryce were joint winners of the 2006 Agile Alliance Gordon Pask award. ... then this book is for you. Finally, there is something that doesn't just say that TDD is as easy as "Red-Green-Refactor" but describes the Big Picture instead. I do recommend this book for those who have already read some stuff on the topic but still have some questions unanswered. GOOS is a revealing walk through the construction of an online bidding system. The authors demonstrate how to evolve meaningful object design during the development process, as opposed to deriving simplistic and static designs by identifying the nouns and verbs in use cases as described in earlier OO books. Throughout the book the reader is guided through a powerful approach to test-first development. The only reason I did not give this book five stars is that some of the frameworks the authors used are no longer available or are obsolete. This makes it nearly impossible to build the system along with the authors. This book has been in my Amazon pre-ordered list for quite a while and I was looking forward to this. I found the title alone already excellent. Steven and Nat (authors of jMock) are well known expert TDD practitioners, so I was looking forward to what they had to say. The book was better than I had expected. The book consists of 5 parts. The first part of a very quick introduction to TDD and jMock. The second part discusses the tdd cycle in more detail. The third part (150 pages) is a very large example of growing a piece of software. The fourth part discusses topics on how to sustain TDD and the last part covers some advanced topics. In this review, I'll skip part 1 as it was short and nothing special. Part two covers the TDD cycle and the link to evolutionary design. Steve and Nat have a design style that focuses almost purely on the interactions between classes which are most frequently tested using expectations on mock objects (which, as authors of jMock, they have lots of experience with). Most notable from part 2, for me, were the classifications of objects that they used, the strong focus on interaction and mocking (more than I usually have when test-driving) and their lack of focus on classes but focus on roles and responsibilities. Nat and Steve clarify their thinking exceptionally well which makes it all easy to understand. Part 3 takes the largest part of the book, which is where they test-drive an AuctionSniper application. It is a small application, but large for a book example. The authors show how they gradually build up the application by adding one test at the time and how they gained insights during this process which made them adjust their design. I had mixed feelings about this part as a book didn't seem like the best medium for doing this, but still I appreciate the insights they had and also their attempt to make it as close to "real world" as possible. Writing tests is one thing, maintaining them in another. Part 4 discusses how to make the tests maintainable and the tdd cycle sustainable. Personally, I found this part very insightful and the authors discipline exemplar. The authors start of with different test smells and what to do about it. They then discuss readability of the tests and of the error messages and spend some time of test object creation. Most notable from that part (for me) was their focus on using builders for creating test data, rather than object mothers. Anyways, in conclusion, this will definitively be one of my favorite (if not the favorite) TDD books and general design books. Steven and Nat did a wonderful job on this one. Though the book is not perfect, I enjoyed it thoroughly. A definite recommendation for anyone interested in modern design and TDD. This book covers the practice ways to apply TDD to project development. Techniques introduced in this book are very useful for developer looking to learn TDD. Great book that helped open my mind to how to test the software I was writing, or rather, write the software that my tests were demanding. A programming book with code samples that are almost impossible to read is a huge drawback. 70% of the value is lost in the kindle version.. I am sure that sooner or later this will be fixed but until then... stick to the printed version. 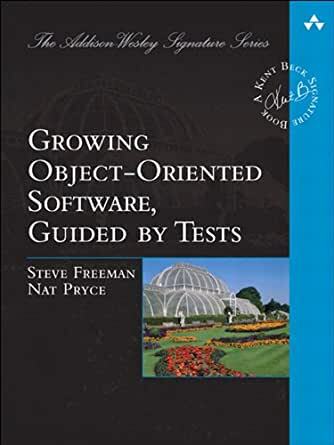 Great book showing how and why developing object-oriented software starting with tests can lead to cleaner and more maintainable code while minimising waste. I enjoyed this book. The code samples are thorough and well explained. The principles in it are carefully unpacked and, whenever possible, illustrated. The authors not only are experienced software developers and but also pretty good communicators.